Her influence is pretty obvious over the last years. It doesn’t matter if it comes through space rock or just small constant drips in many of the best albums that go through the end of the year top lists. Acts like Prince Rama, Unknown Mortal Orchestra, White Denim, MGMT, Animal Collective or Foxygen to name a few, have embraced psychedelic without caring about its fashionable side. No doubt that a contemporary standard such as Tame Impala’s Lonerism has given more than a hand to the genre. But the fact remains that there are so many young bands considering also the legacy of the past, in some cases without the invaluable help of a named producer. This is the case of this band from the small town of Kettering, 2 hours north of London. Jeff Barrett, the owner of Heavenly Records, discovered them just on time for their first appearances as a band and offered them to release their first single and album. 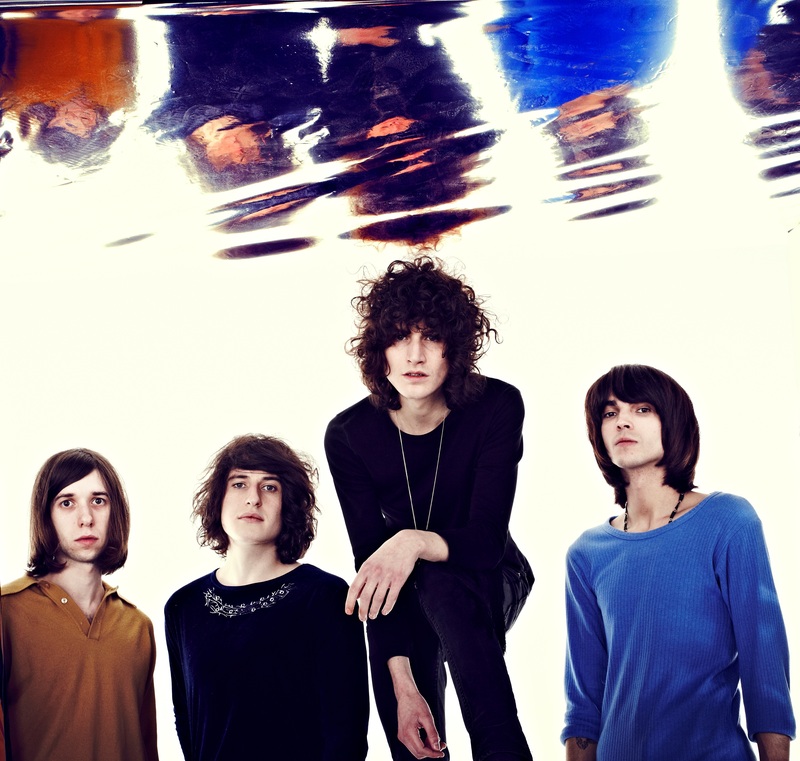 Over a year and a half after that, Temples are releasing Sun Structures ([PIAS] 2014), an astonishing debut with strong support from the likes of Johnny Marr and Noel Gallaguer among others. We get to talk about Sun Structures with bassist and co-founder Thomas E. Warmsley, while he’s promoting the album in London. Fine, we just got back from Spain yesterday, we’ve been in Barcelona yesterday, it was a good trip. We’re looking for to coming to Madrid also, we haven’t been there yet. 2 years since you gave us some really good singles, but it seems like you’ve been doing this forever. Was it just the right time to release the album? We have done a lot the last year and a half. When we started as a band, at the end of summer of 2012, we wanted to create a collection of songs that people could listen to straight away. So we uploaded 4 songs on YouTube. While other bands might not have a recording at all to begin with, or perhaps maybe just one song, I think the four songs introduced people to us, and perhaps people feel more familiar with us. It really helps to inform everything we’ve done next, just having a strong idea of what we wanted to achieve with the record, and recording it in between touring. We had strong visions since the beginning of what we wanted to achieve. You got a record deal and a single just before you had performed together. Well, I think we had played a couple of shows. And I think just after 4 months that we had written some of the songs and put together the whole line up, Jeff Barret from Heavenly (Records) got in contact with us as he wanted to release our single. I think Heavenly is a record label that is one of the greatest independent labels here in UK. They’re very active. And the fact that we recorded it ourselves with all the strong ideas we had from the beginning… it was a real pleasure. Sun Estructures is being made completely at home and with no other producers than yourselves. Was that a choice you made or is it just that you’re not comfortable with producers? I guess bands are influenced by producers. We have a strong passion about the production of the record, and a lot of our favourite records are really led by that sound. People like Brian Eno, Jack Nitzsche have got a signature sound, and brought something unique to the songs that they worked on. For us the sound of the record was as important as the songs, and get through a label and recording it ourselves we thought that was an important element to retain and to keep on to, especially for this first record. And also it has to be the cheapest way, you know, not having to spend a fortune in a professional studio. Did you expect such a good reviews? Not at all, really. The very reason Temples exist is because we recorded 4 songs in Jamie’s studio, and just because we enjoyed how they sounded and what we’ve captured on those songs, and the fact that people react it’s something we really appreciate. We really just carried that through to the album. Just capturing what we’ve done. And it’s fantastic if people understand what we’re trying to achieve on the record. Did you record the full album with analogue equipment? When it comes to capturing sounds, although we’re using analogue effects, tape machines or old microphones, we embrace the digital side of technology, sound clean, sequencing… Embracing both is really important. Restricting yourself to try to create an exact replica of bands from different decades is probably quite defeatist in many ways. We like to embrace contemporary music as much as older influences. How is the writing process? Do you all pretty much write the songs together? Yeah I mean, all of this album has been writing in the studio, and whenever we had an idea we often recorded straight away. We kind of build the picture around an idea, and record it straight away. Is very studio based, and is quite impulsive in terms of, if a song is on the canvas is we’ll keep working on it until we’ve achieved an atmosphere around the song. And it seems to work for us! If you have a look at your influences, it seems like were born in the wrong decade. I don’t think that any decade has more influential than another. We have the privilege that all our favourite influences are from the last 50 years I suppose. We found 60’s pop songs was influential, 70’s experiments with sounds, the electronics of the 80’s, and the sampling of the 90’s. We’re quite privilege that we were born in this decade, and have such a legacy of great music. Should we redefined the meaning or the word “Psychedelia”? It’s a word that appears an awful lot in these days, especially over the last year or so. For us in particular, I think something can’t be defined psychedelic in a material sense, I think is more a feeling of the music. No matter what style or influence, is how you react to it, and that experience and the feeling which is probably psychedelic rather than a particular sound or a particular image. I think is left to everyone’s interpretation. I think as long as it’s left by that in the music, I don’t think people can go to far wrong. It could be dangerous if it’s considered a temporary fashion. Each decade embodies a psychedelic element. I think more often people are aware of that and it’s in everyone conscious of music perhaps. It’s about a perception, a psychedelic path. There are so many different styles of music, from dance to electronic, jazz to folk, it has the power of imagery, and I think as long as people realise that, then is a good thing, and it will reinvigorate interest in live music as well. You have a bunch of shows coming, like Coachella or Primavera, but what are your plans for this year? We are very excited to finally have a record out and we feel like perhaps the people would understand Temples slightly better now that they’re fully informed of every spectrum of our sound. We’re very much looking forward to touring as much as possible and really bring the record to live live, and extending what people are experiencing on the record in a live environment and the whole process of that is what we are most exciting to do. Yeah! We’re very happy, very excited for the record and to get out there and play to as many people as possible. And I hope you’re happy too.